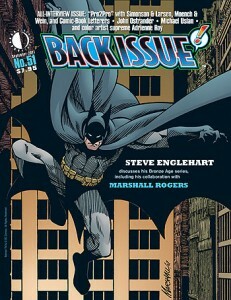 On September 14, BACK ISSUE #51 ships, and editor Michael Eury is featuring a bittersweet interview with the late Adrienne Roy, who passed away in December 2010. Ms. Roy is known for her color work on some of the key DC comics of the 1970s and ’80s (New Teen Titans, among many, many others), and she was even featured as a character in several comics of that era, so loved was she by the creators she worked with. It’s a great tribute to a great lady. This “all interview” issue also features Part 2 of our STEVE ENGLEHART interview, begun in Alter Ego #103 (released last month). plus “Pro2Pro” interviews between WALTER SIMONSON and ERIK LARSEN, DOUG MOENCH and LEN WEIN, and comics letterers TODD KLEIN and JANICE CHIANG, plus an in-depth discussion with JOHN OSTRANDER. And check out the cover above; that’s one of the last Batman illustrations produced by the late MARSHALL ROGERS, who was Englehart’s partner on Detective Comics. Here’s the link for a free PDF preview. It’s a great issue (as usual for Mr. Eury), and you can order here. This entry was posted in TNT on 2 September 2011 by Mr. Morrow.